Elements Europe has installed its first room modules into a brand new Premier Inn, located in Exeter’s city centre. The 120 bedroom hotel development is being delivered as a turnkey solution by The Pickstock Group with Pickstock Construction acting as the main contractor and Elements Europe the modular manufacturer. The room modules have been manufactured to the strict specification of Premier Inn ID3++ Dark standards. Elements Europe will also provide linen rooms, stair cores, corridor cassettes and the flat roof structure for the development as part of their room module system. The site is located on sloping ground and will incorporate a double level of insitu-cast concrete structure to accommodate two levels of underground parking below the hotel. 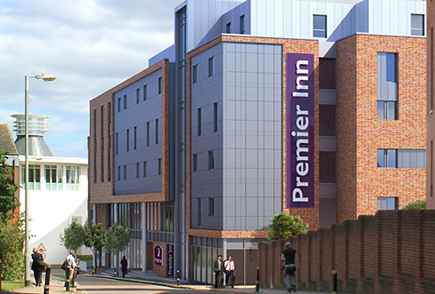 Boasting a prime location in the heart of Exeter the hotel is set to open in 2015. Pickstock Construction has collaborated with sister company Elements Europe, modular manufacturer, on numerous occasions facilitating faster construction programmes. “Modular construction is perfectly suited to the hotel industry expediting the construction process significantly, thus enabling the client to open sooner” commented Nick Davies, Construction Manager at Pickstock Construction. “The Pickstock Group’s experience in both traditional and modular construction enhances the construction process allowing for a seamless integration from the work on-site to the work within the factory” added Nick.